On Nov 8, Narendra Modi announced demonetisation of notes of Rs 1000 and Rs 500 giving big surprise to the nation and fighting against Black Money. Some people started writting on notes with ‘Sonam Gupta Bewafa Hai’ which started trending on whatsapp and various other social media. It has been claim that suddenly rejected lover is trying to malign the image of Sonam Gupta by circulating it on notes of Rs 1000 and Rs 500 even on coins it has came. Sonam Gupta’s name was found written on several of the currency notes, even on coins. From Nepal to Singapore to America, Sonam Gupta has been declared international bewafa. Notes are temporary, “SonamGuptaBewafahai” is permanent !! Aaj ki taaza khabar Sonam Gupta bewafa hai. Interviewer – Aap humse hi question puchne lagi. …Anyways Bewafa hai. 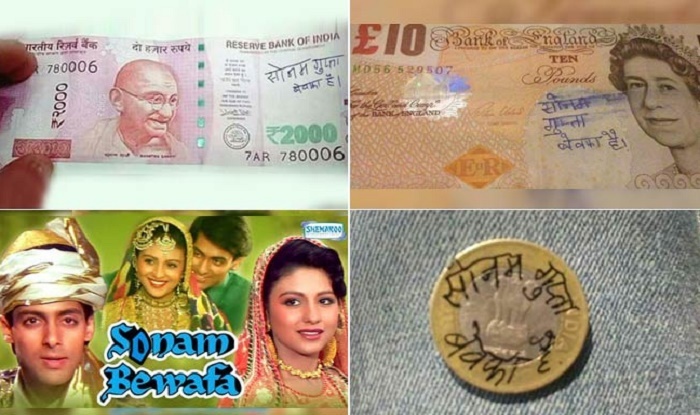 Even when the new Rs 2000 came in markets, social media got flooded with notes written ‘Sonam Gupta Bewafa Hai’ on them. DISCLAIMER: This story is entirely based on social media humor and viral content; Redicals doesn’t wish or intend to offend or upset anyone by means of this story.